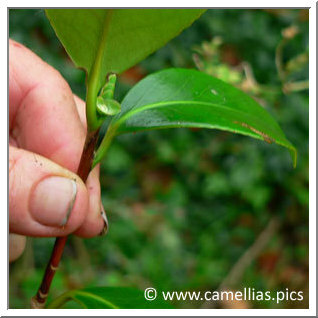 Here is one of many methods used for collecting camellias cuttings. Note that the rooting is longer than for other plants. To allow the roots to grow from the inner part of the living bark (the cambium ) you must ensure a minimum of heat (not excessively so as not to "cook" it) and humidity (to prevent dehydration or, conversely, the decay). Success depends on mastery of these two parameters. Bring your personal touch to get better results. The cutting is done in the summer. 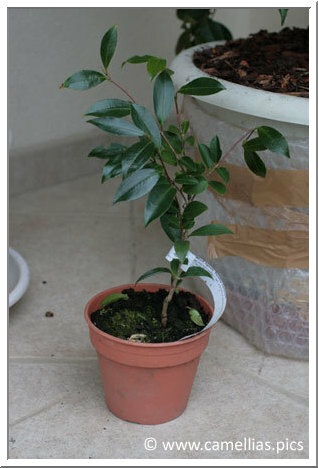 Choose preferably new branches (grown in august, rigid, with brown barks). They must be strong and with well formed buds. 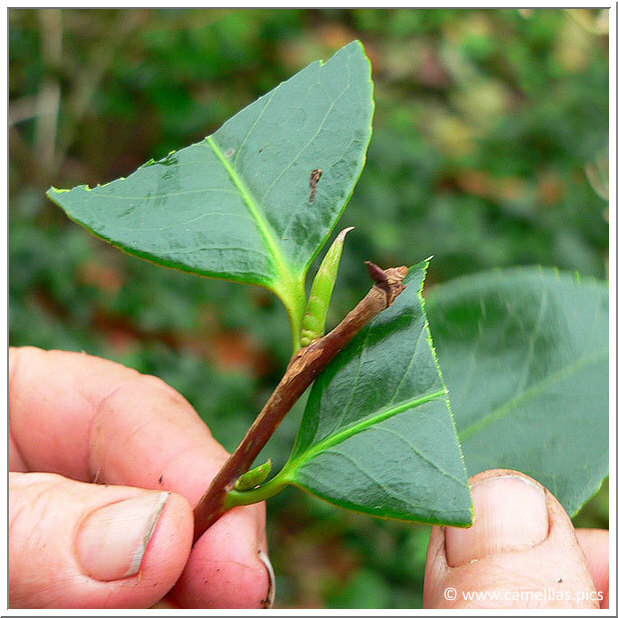 Take a part with three leaves at the head of the branch. 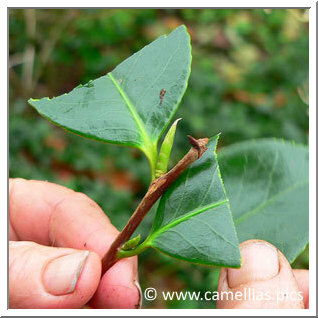 Cut the base (as shown above) and reduce two leaves by half (it will decreases water loss). Remove the third leaf. If you start from a two leaves part, keep them both. 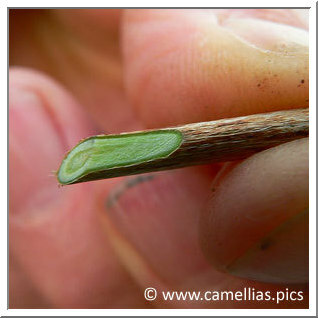 You can also remove the flower bud and terminal wood bud. Put them in small pots (7x7x7 cm). You can leave the cuttings in them for two years. 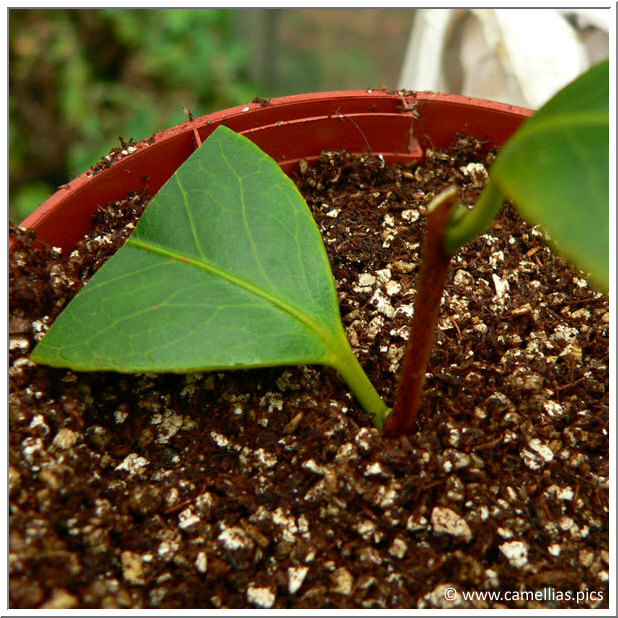 Use a special cutting soil or a thin and light mixture, which will keep moisture (pH 6 or lower). You may use rooting hormone. If you do, use very little, or a "thin layer". 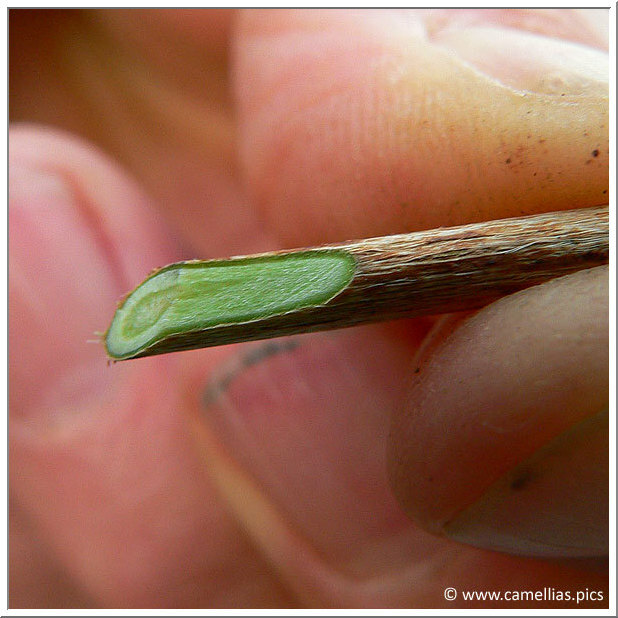 Moreover, make a small hole in the ground with a stick not to remove the hormone when you will plant it. Keep the cuttings in the shade (not in the dark !) for a year, basting occasionally. You must find a sheltered place to store them. Consider wind, temperature differences (cold or hot) and animals (rodents, pets, etc ...). 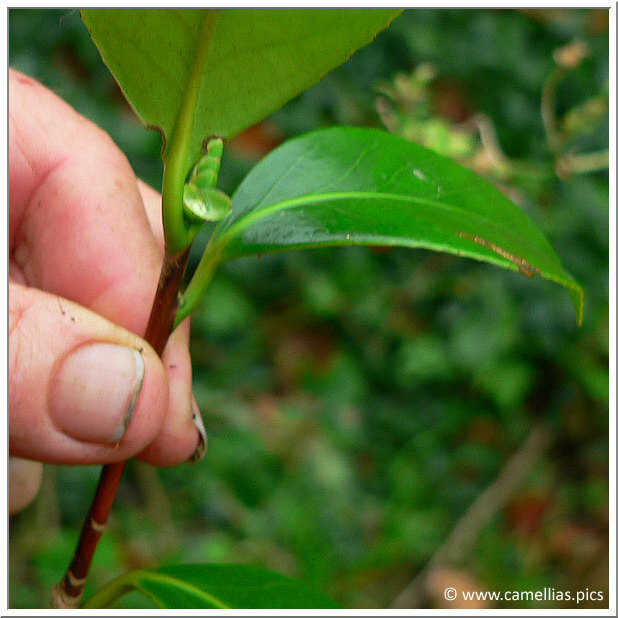 If you make several cuttings, you should tighten them against each other and protect them in a mini tunnel. If you choose larger pots, a plastic bottle cut in half will provide protection before you put them in a tunnel. The plastic bottle has an advantage because it allows you to easely control the humidity rate: if there is no more moisture condensation inside, it is time to water. In May of the following year, we can remove the protections. But you must always keep the cuttings at the shelter and shade. 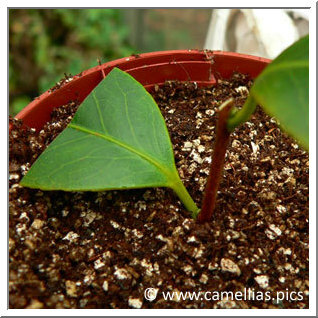 When the roots have colonized the whole pot and are visible from the outside, it is time to repot into a little bigger container. 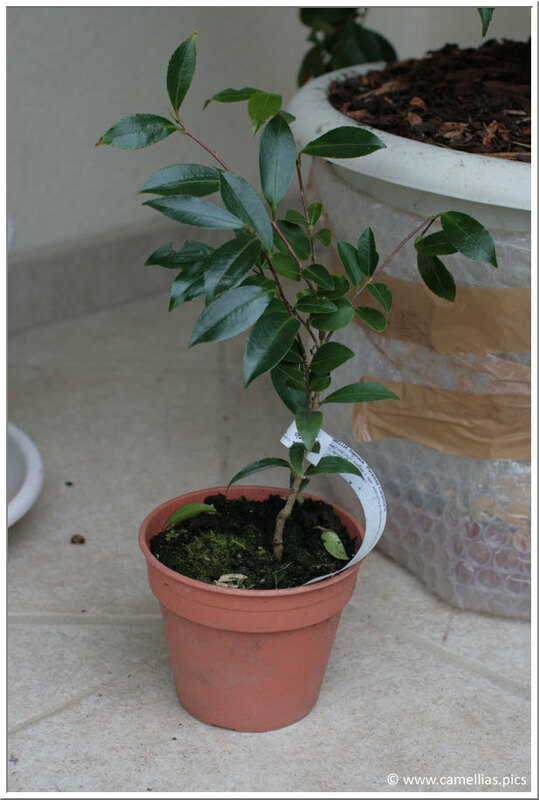 Keep it in shelter for another year (ie, at least up to two years in total), then repot in a bigger pot or put it in the ground. Here's a little 'Paradise Caroline' three years old. I repotted it this spring. I will let him grow before thinking about finding him a place in the garden. Amateurs can reach, with a little practice, a success rate approaching 100.